Q: Why do so many schools ask for these? A: The Common App used to require that students write a 1,000 character (approx. 150-word) extracurricular statement. When in 2013 the Common App dropped the requirement, many colleges kept it as a supplement. Q: Do I really have to write it? Q: Which extracurricular activity should I write about? A: I write about that here. Q: What should I say? How should I structure it? a. What did you literally do? What were your actual tasks? b. What did you learn? With 150 words, there’s not a lot of room for much more. And while your main statement is more “show” than “tell,” this one will probably be more “tell.” Value content and information over style. VIOLENCE IN EGYPT ESCALATES. FINANCIAL CRISIS LEAVES EUROPE IN TURMOIL. My quest to become a journalist began by writing for the international column of my school newspaper, The Log. My specialty is international affairs; I’m the messenger who delivers news from different continents to the doorsteps of my community. Late-night editing, researching and re-writing is customary, but seeing my articles in print makes it all worthwhile. I’m the editor for this section, responsible for brainstorming ideas and catching mistakes. Each spell-check I make, each sentence I type out, and each article I polish will remain within the pages of The Log. Leading a heated after-school brainstorming session, watching my abstract thoughts materialize onscreen, holding the freshly printed articles in my hand—I write for this joyous process of creation. One day I’ll look back, knowing this is where I began developing the scrutiny, precision and rigor necessary to become a writer. Check out his active verbs: writing, delivering, editing, researching, re-writing, brainstorming, catching, polishing, leading, holding, knowing. 2. Tell us in one good clear sentence what the activity meant to you. 3. You can “show” a little, but not too much. The first one grabs our attention; the second paints a clear and dynamic picture. Keep ‘em short! When I applied to West Kendall Baptist Hospital, I was told they weren’t accepting applications from high schoolers. However, with a couple teacher recommendations, the administration gave me a shot at aiding the secretaries: I delivered papers, answered phone calls, and took in patients’ packages. Sadly, inadequate funding shut down large sections of the hospital and caused hundreds of employees--myself included--to lose their jobs. But then Miami Children’s Hospital announced openings for inpatient medical volunteers. Again, I faced denial, but then I got a chance to speak to the lead inpatient medical physician and cited my previous experience. While working at MCH, I delivered samples, took down visitor information, administered questionnaires, and organized records. I helped ease the work of the nurses and doctors, while delivering medicine and smiles to dozens of patients. I may not have directly saved any lives, but I’d like to think I helped. Did you initially face an obstacle? In the first sentence say what it was, then in another sentence say how you worked through it. That’ll show grit. Note that this essay has not one, but two obstacles. And each time the writer worked through it in just one sentence. Brevity ftw. This applies to fundraisers too (say how much you raised and for whom) and sports (who’d you impact and how?). 6. Write it long first, then cut it. Both these students started with 250-300 word statements (get all the content on the page first). Then trim ruthlessly, cutting any repetitive or unnecessary words. 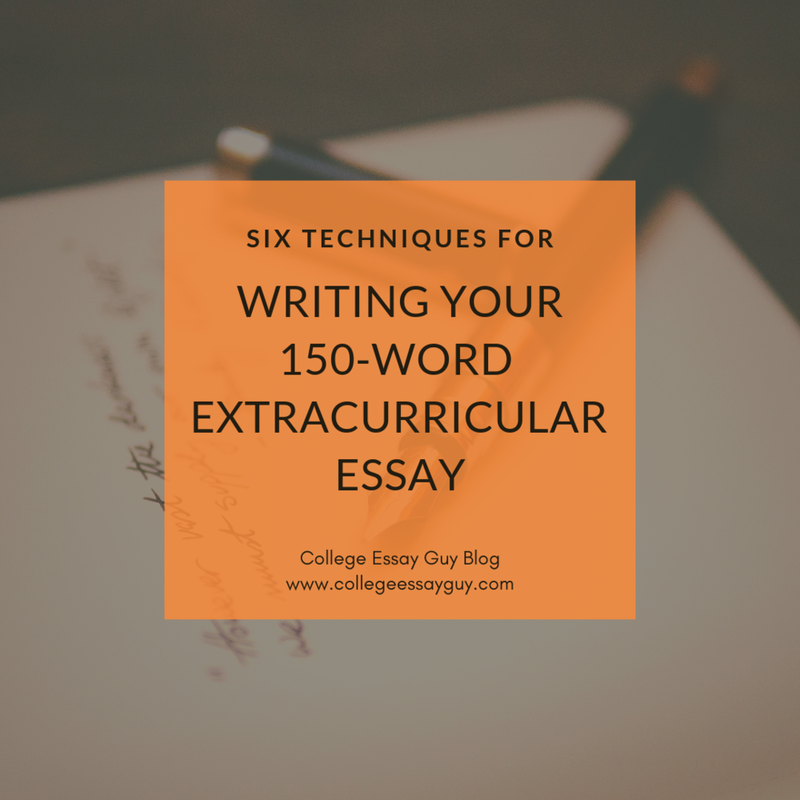 WANT SOME HELP TAKING YOUR Extracurricular essay TO THE NEXT LEVEL?